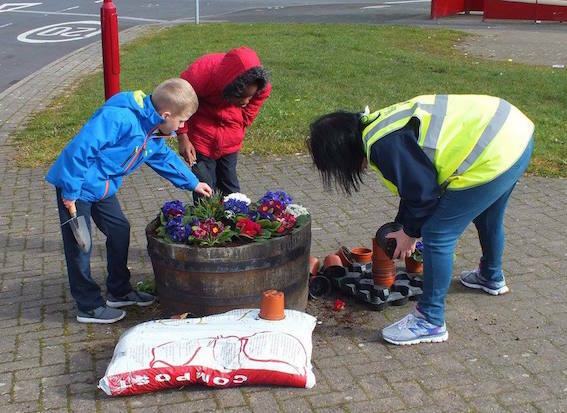 We start this week in Belle Isle, where pupils from Windmill Primary were out with Belle Isle & Middleton In Bloom carrying out some spring planting last week. Our own Ken Ingram was there to record the event. Sad to say some of the plants have been stolen since then. Meanwhile Cottingley In Bloom have completed the planting of their community orchard which now has 65 fruit trees. Students in the Interact Club at The South Leeds Academy held a cake sale to raise funds for Sport Relief. It’s official, the Year 4 classroom at Park View Primary Academy has the best book corner in Leeds. As usual there’s lots going on at the Hunslet Club. They have their annual Fun Runsie fun run in a onesie on Easter Sunday morning. They have a slightly more serious fun run in Middleton Park on 10 April and are looking for volunteers to help on the day. What could be better than a third anniversary celebration? Two celebrations! And that’s what Cross Flatts Parkrun is planning. This Saturday (26 March) will see a children’s Easter Egg hunt and the following week will see a fancy dress run, followed by cake at St Luke’s Church. There’s a lovely post on the Run Leeds blog about the first few weeks of the Leeds Girls Can Run beginners running group, which has attracted a fantastic 27 ladies, or 27 fantastic ladies if you prefer. The amazing 15th century timber framed Stank Hall Barn will be open on Saturday (26 March). Don’t miss the opportunity to have a look round and if you have some spare time you can help out in the community garden whilst you’re there. Adults and children can enjoy free craft sessions at the Belle Isle Family Centre café on Wednesday 20 and 27 April. The new John Lewis store in Leeds will create over 500 jobs. Housing Leeds has posted details of information sessions being held next week on 31 March and 1 April ahead of the jobs being advertised. St Andrew’s Pantomime Group in Beeston gave away a massive £2,500 to five charities at their AGM last week. The money was raised from ticket sales and raffles at this year’s Sleeping Beauty show. Calling all frustrated adults that always wanted to try cheerleading – your wait is over. White Rose Cheer are stating a senior team with no upper age limit, starting Tuesday 19 April. Need to redo your nails? Shine Nail Bar has Easter offers on.